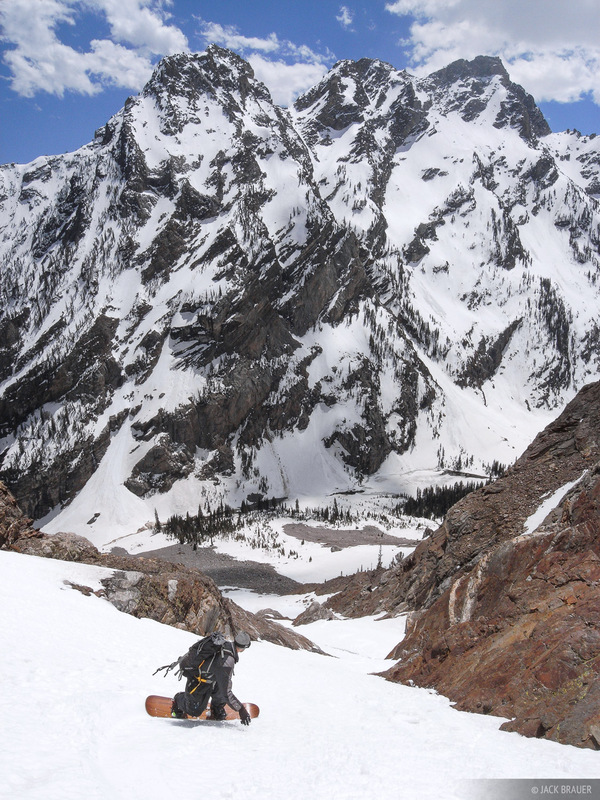 This May 2009, I headed up to Jackson, Wyoming to snowboard some big spring lines in the Tetons with a buddy of mine who lives up there. My timing could not have been better, with solid snow conditions from top to bottom of the peaks, and perfect sunny spring weather. 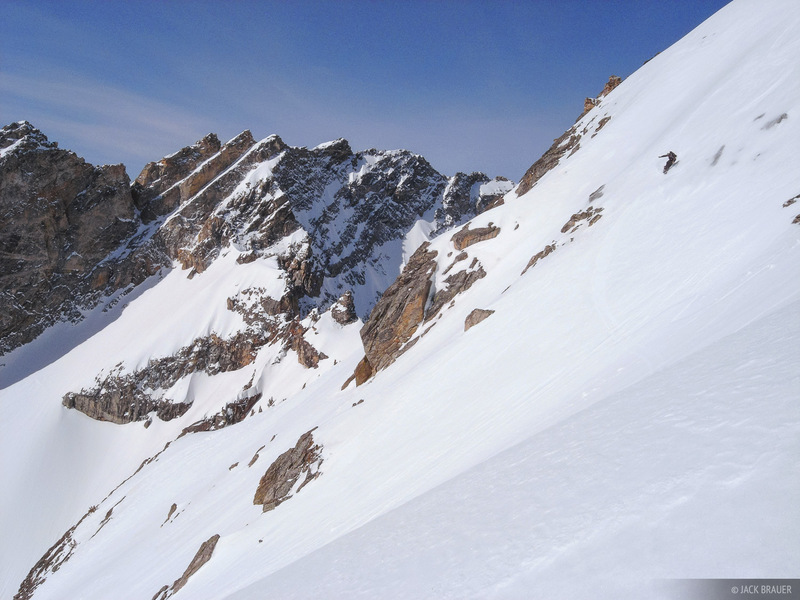 We hiked and rode 5 big lines while I was there, for a total of well over 20,000 vertical feet of sweet carves. It was really fun to explore and ride the Tetons, which are steeper, larger, and generally more burly than our mountains here in Colorado. Also the snow was in great condition, unaffected by the terrible dust storms that smothered the mountains in Colorado this spring. Our first objective was a straightforward route on Rockchuck Peak, with quick easy access and a nice 4,000 foot descent. 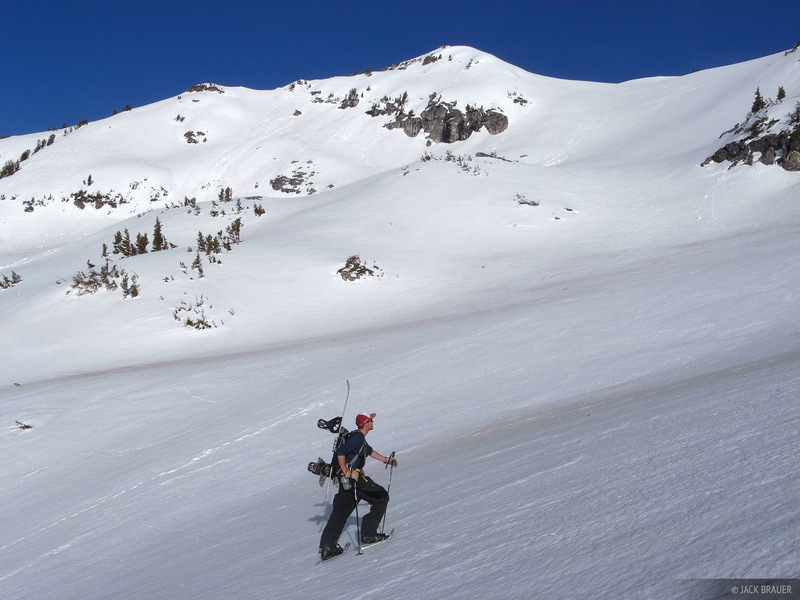 Here's Jason hiking the top ridgeline, with Mt. Moran and a partially frozen Jackson Lake in the background. The rugged southern slopes of Mt. Moran, as seen from the summit of Rockchuck Peak. 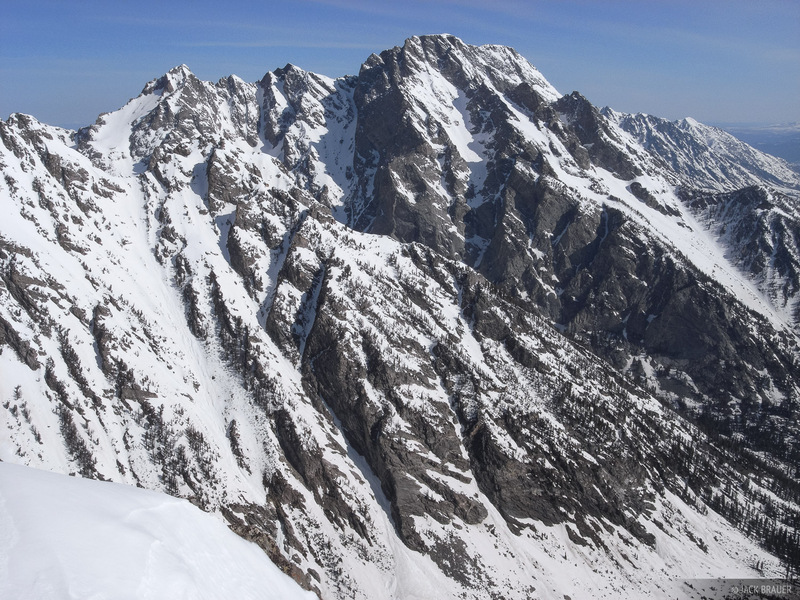 Jason King drops in to the steep east face of Rockchuck Peak. 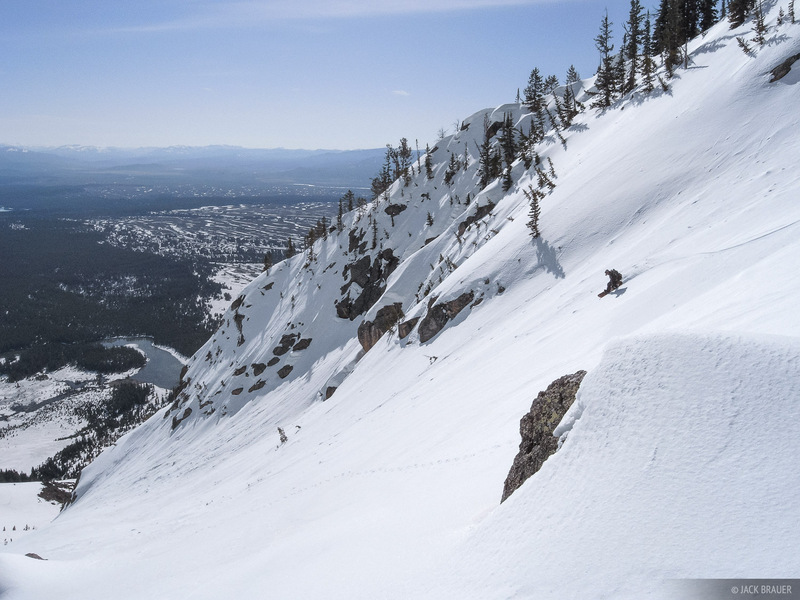 Snowboarding the middle slopes of the east face of Rockchuck Peak. Rider: Jason King. Day 2 we hiked and rode Static Peak. 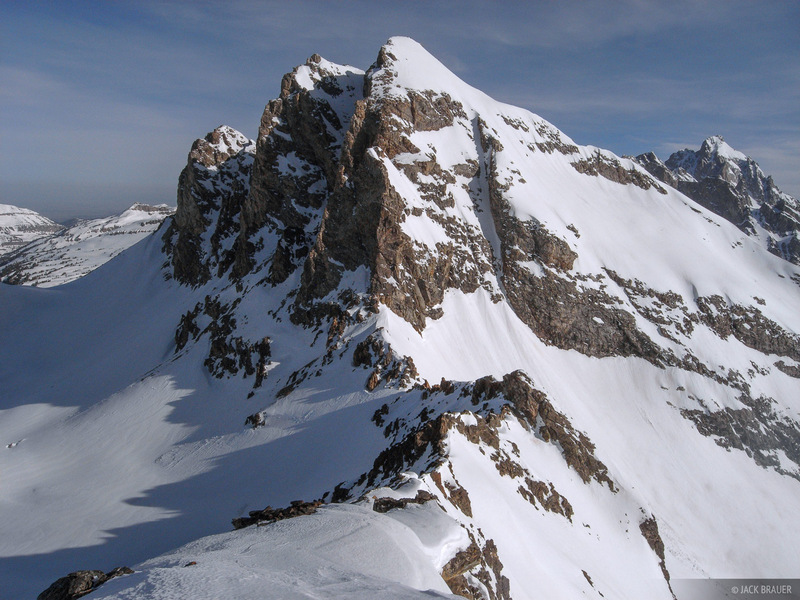 This peak is part of the Buck Mountain massif, a region of the Tetons that has gentler slopes and seems to hold lots more snow than elsewhere. The uncharacteristic mellowness of the basins up here reminded me of typical Colorado terrain. Though some Jackson locals might consider this a "boring" objective since it doesn't involve gnarly exposure, etc, it actually provided the best snow of the whole trip, and was probably my favorite line we did as far as the perfect snow surface, with over 4,000 vertical feet of high speed buttery carves. 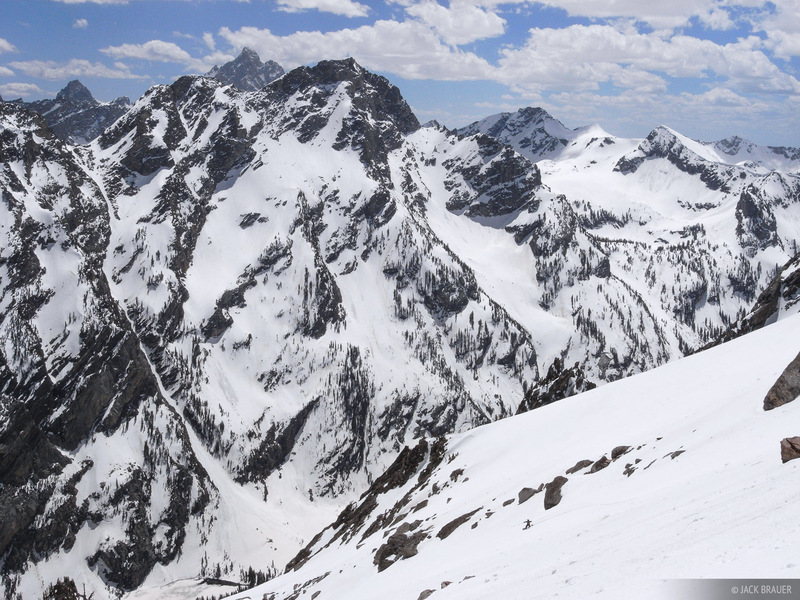 Long cruisy run on perfect spring corn snow on Static Peak. Snowboarder: Jason King. 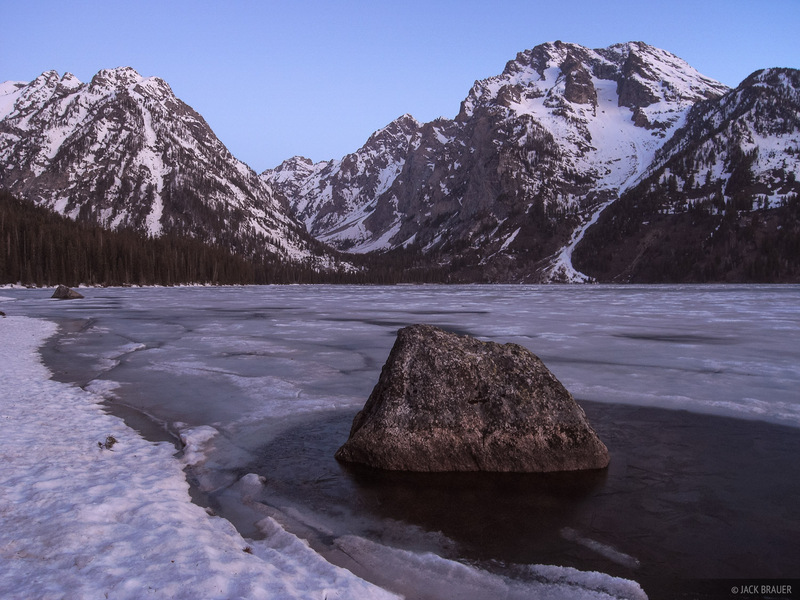 Dawn light on the shores of partially frozen Leigh Lake, looking towards the rugged peaks of Leigh Canyon. Despite being pretty worked from the first two days, on day 3 we headed out for the biggest line yet - a southwestern couloir on Mt. Moran, one of the biggest peaks in the Tetons. 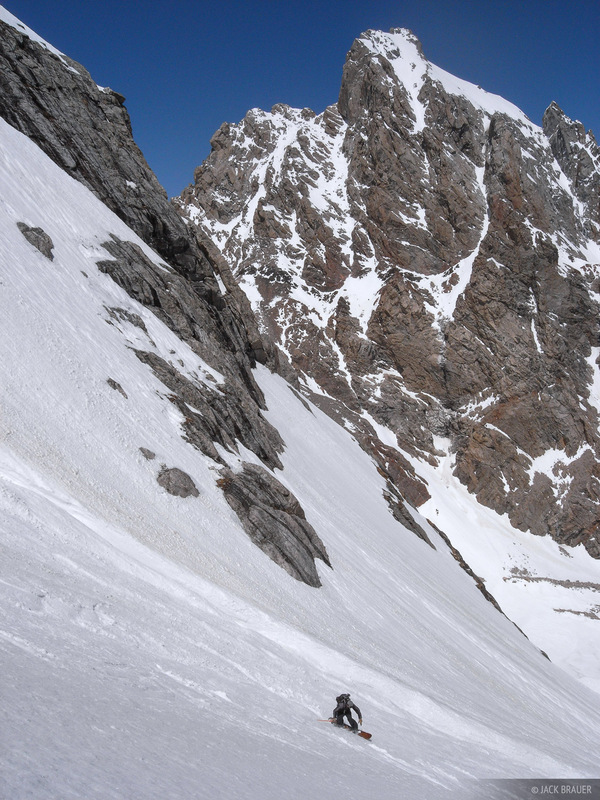 After a pre-dawn bushwhack around the shores of String and Leigh Lakes, we made it to the bottom of the couloir. We bootpacked straight up the line, topping out along the west ridge of Mt. Moran, and then rode down 5,000 vertical feet of soft snow. What a great line! 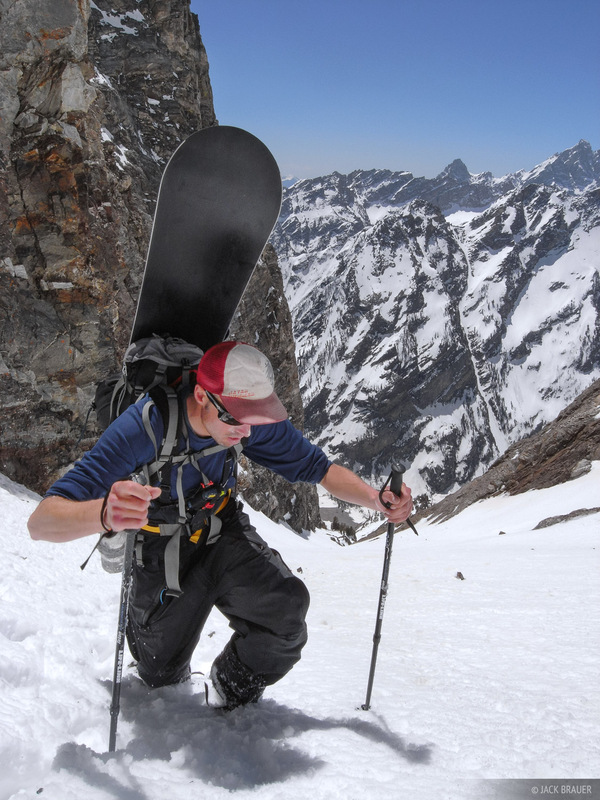 Bootpacking up the long southwestern couloir on Mt. Moran. 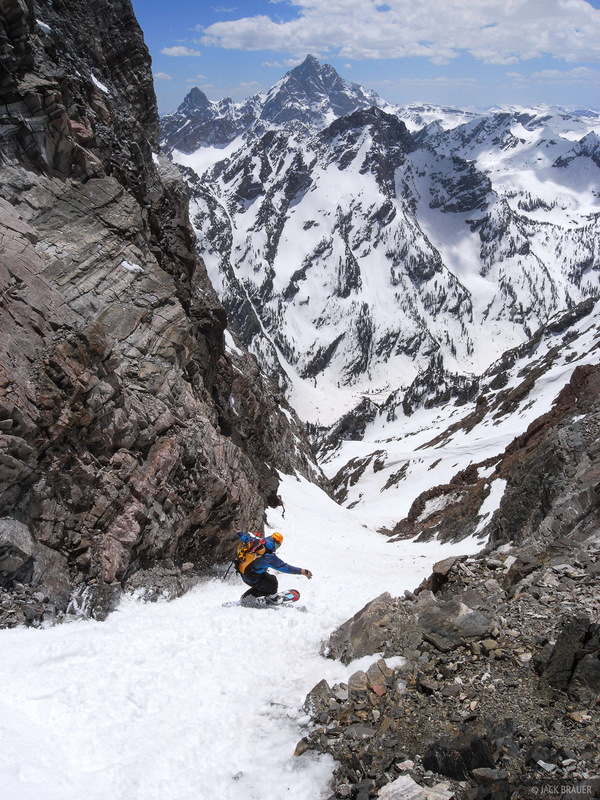 Dropping in the steep couloir on the southwestern slopes of Mt. Moran. The Grand Teton dominates the southern horizon. Snowboarder: Darrell Miller. 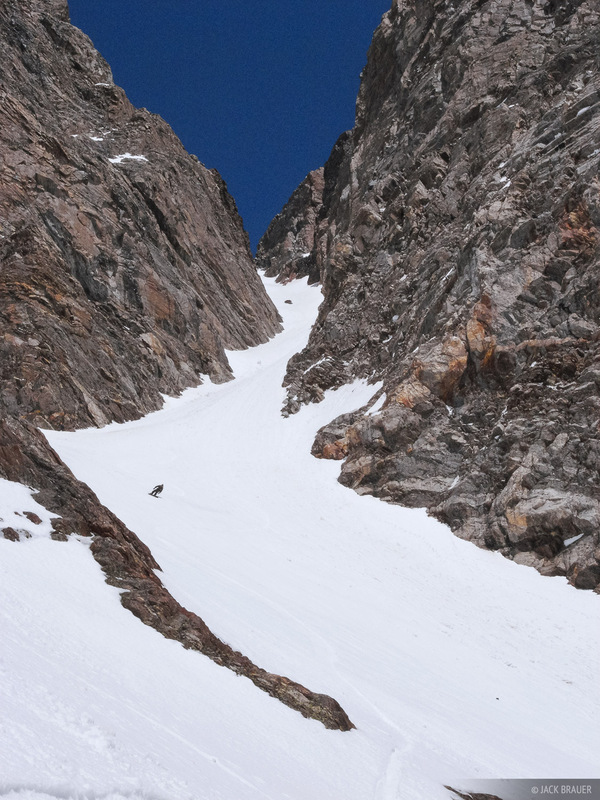 Looking up at the Southwest Couloir on Mt. Moran, as Jason King snowboards down. 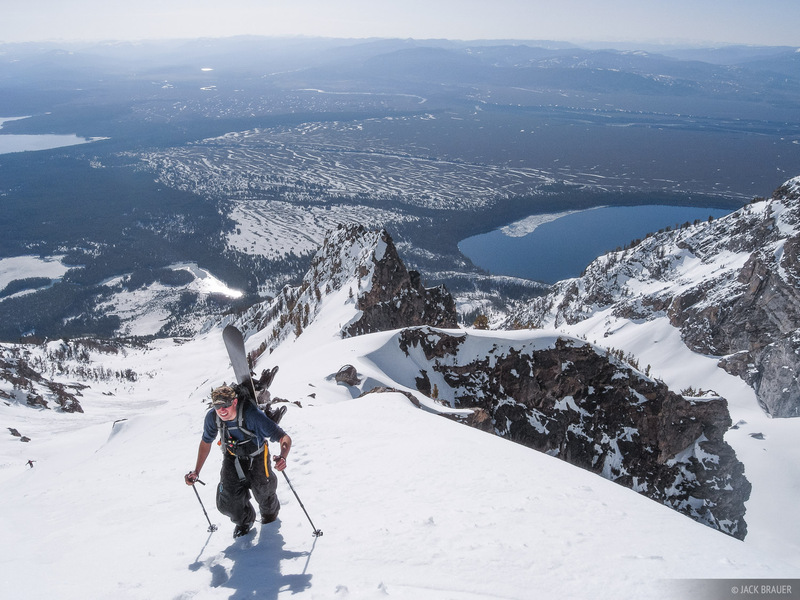 Darrell Miller snowboards down the long southern slopes of Mt. Moran, with a rugged Teton backdrop. 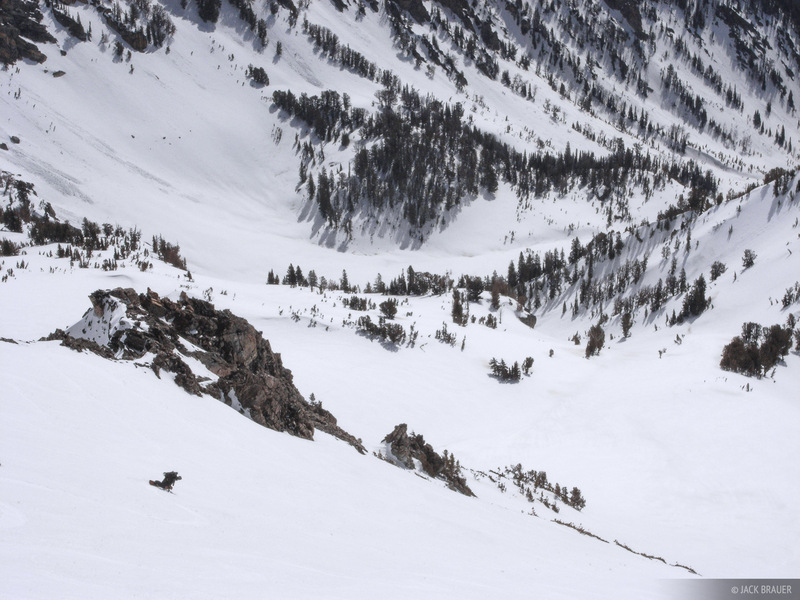 Jason King snowboards the lower chutes towards the end of a 5,000 foot descent of the southern slope of Mt. Moran. After a couple days of rest during unsettled weather, we headed up into Garnet Canyon, into the very heart of the Teton range. 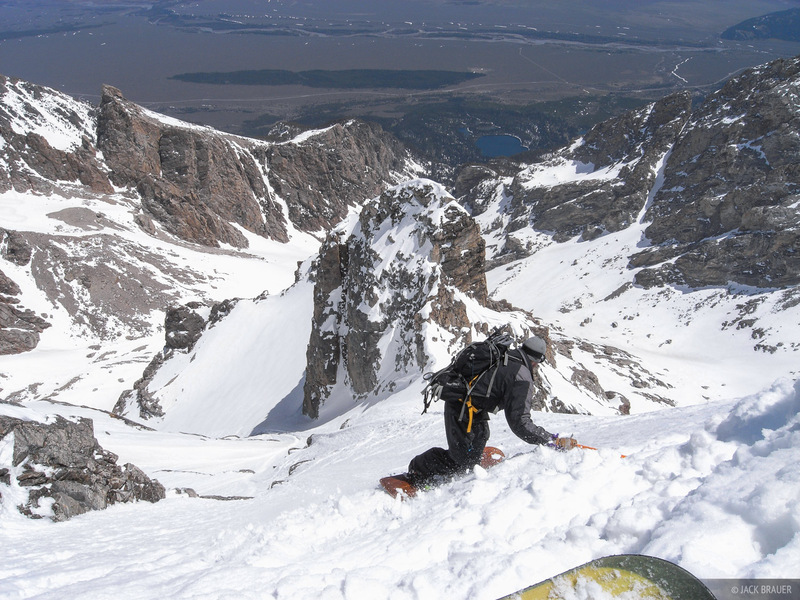 Our objective was the southwest couloir off the Middle Teton, but we were disappointed on the way up to see that the line wasn't really all that great, and was in crappy condition full of chunder. But we kept heading up, and when we topped out we saw that the big northeastern face looked much bigger and better. The decision was easy. After a brief pause at the top to check out the incredible view of the Grand Teton right in front of us, we dropped in for an initial exposed traverse over some hairy cliffs, then rode down the incredibly steep and gripping face of the Middle Teton Glacier, for another whopping 5,000+ foot descent. 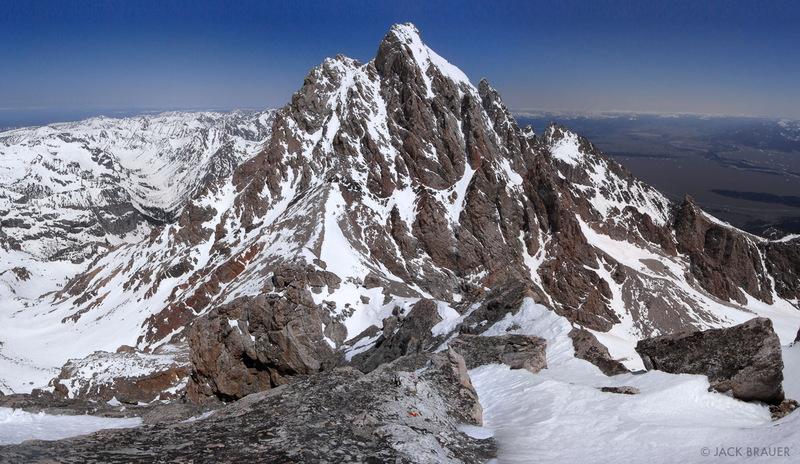 Awesome view of the southern side of the Grand Teton, as seen from the summit of the Middle Teton - May. 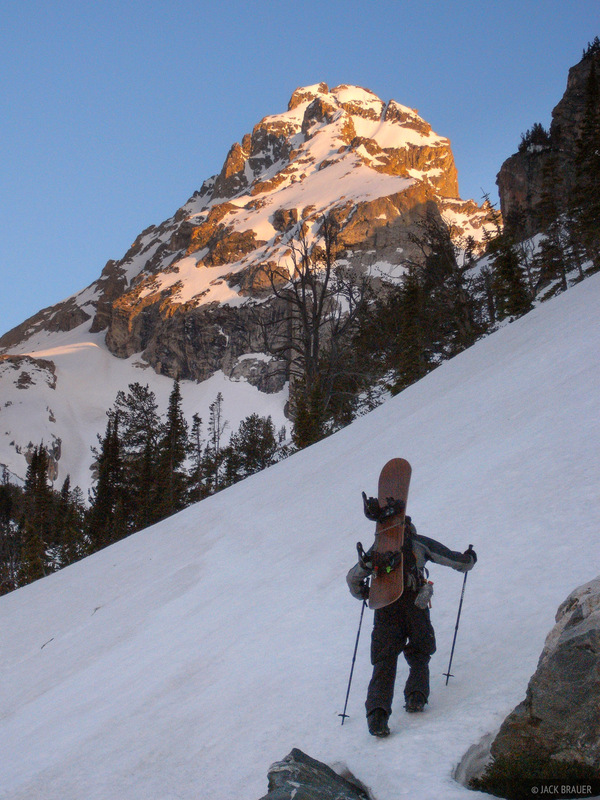 Jason King drops in to the steep northeast face of the Middle Teton. This is a lot steeper than it looks in the photo! Snowboarding the Middle Teton Glacier, the steep northeast face of the Middle Teton, with the Grand Teton towering in the background. Rider: Jason King. Granite Canyon. Rider: Mike Paris. For our fifth riding day, we decided to do something a little more relaxed. 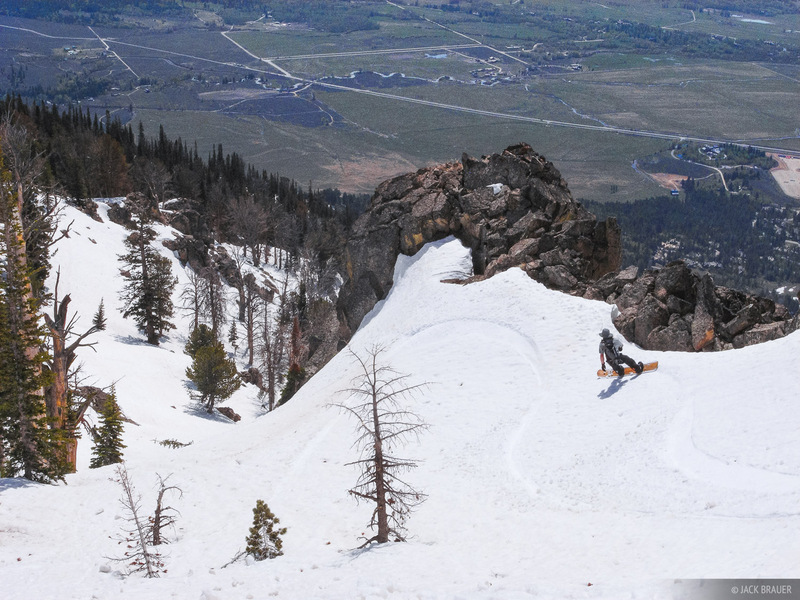 The Jackson Hole ski area tram was opening up for the first day after the winter, so we took a ride up to the top and dropped off the backside into Granite Canyon, a popular (if not incredibly dangerous) backcountry area during the winter. With almost no effort compared to our previous hikes, we soon found ourselves at the top of some nice steep 2,000+ foot couloirs, and enjoyed nonstop descents to the creek below, and an easy hike out the dry trail. 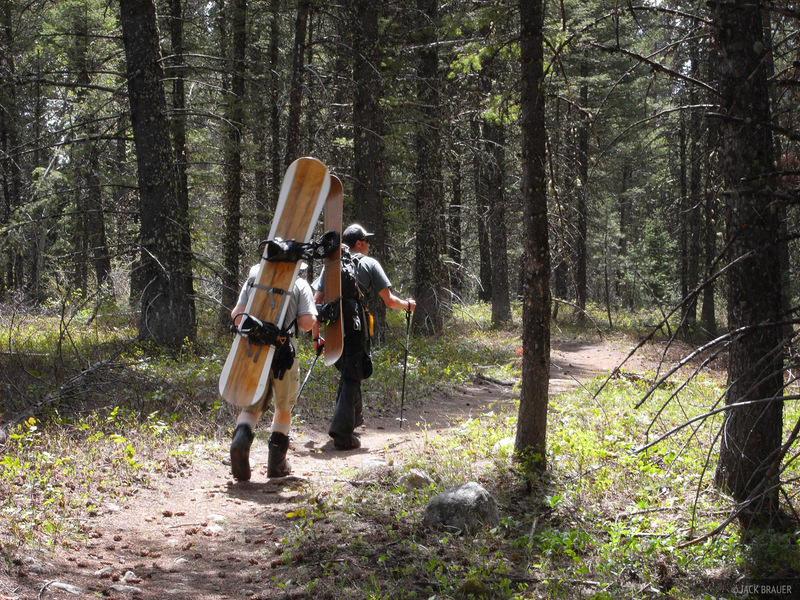 Hiking out the forest trail after a good day of riding. Big thanks to Jason King and the Simpson House for the hospitality. I'll be back! Posted in Skiing & Snowboarding and tagged Wyoming, Tetons.